A view of the County Hall of Chelmsford in Essex in aquatint. 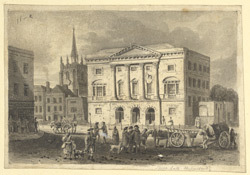 Now known as Shire Hall, it was built between 1789-91 by architect and Surveyor of the county, John Johnson (who also published this print). The hall is five bays wide with the centre three bays flanked by giant columns with Adam capitals. The ground floor is has rusticated stonework and there are three entrance arches. The Shire Hall was located in Tindal Square - the centre of the town. It was a busy area where pedestrians congregated and rows of shop fronts opposite it. Behind it is the tower of Chelmsford Parish Church.